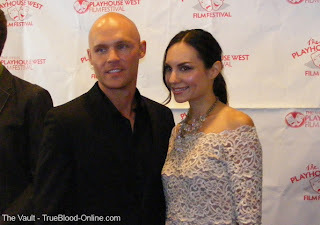 On Friday, June 10, 2011 the Playhouse West Film Festival opened at the El Portal Theater in North Hollywood. 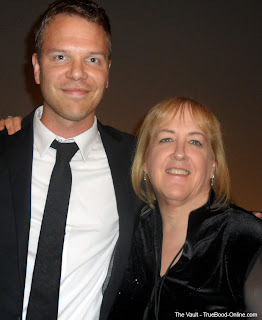 On this opening night, I attended the Premiere of Jim Parrack’s new film, POST. We all know Jim as Hoyt Fortenberry on True Blood, and now we see him branching out of acting into other realms. “Post” is Jim’s directorial debut and was an extremely personal experience for him. His wife, Ciera and his best friend Scott star together in the film and Jim uses not only most of his family but a lot of his friends as actors. As I said, it’s an extremely personal film that brought Jim out of a bad experience in filmmaking and made it into a good one. About Playhouse West: It is a training ground for actors, writers and directors founded by Robert Carnegie and Jeff Goldblum in 1981. Highly regarded and recommended by industry professionals as the premiere acting school in the country, many of their members go on to work at the highest level within the entertainment business. In addition to the festival’s showing of Post on opening night, Jim also is seen in another film called “Simone”, directed by Wolfgang Bodison about a young black woman and her white boyfriend who are forced to make important life decisions involving class, race and love. Before we saw the film last Friday, I attended the “red carpet” event for the Playhouse West Film Festival. Earlier in the week, I had met with Jim at his house with Ciera and Scott and interviewed the three about the film. You can see that interview, in which Jim talks about the experience and how the film saved him here. 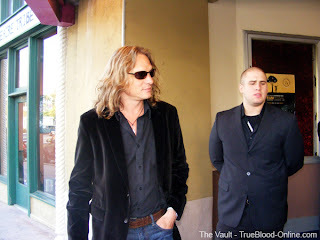 Below are some photos and pictures from the Red Carpet Premiere event. In addition to Jim and Scott, the four women together, in the photos, are: Olivia Dudek, Ciera Parrack, Katie Ryan, and Katherine Boecher. In the first row of photos you see Abri van Straten, who did a beautiful job of writing the original music for the film. Below is a video from the Red Carpet that includes the ladies in the movie (the dancers) Olivia Dudek, Ciera Parrack, Katie Ryan, Katherine Boecher along with Scott and finally, Jim. As Ciera tells us, Post is a story that travels from tradegy to hope. It’s about a woman named, Sophia who after repeated attempts to avoid reality has alienated from herself, her friends and her art. This dancer must confront a simple but terrifying problem; die or face the most horrific truths about her life with the hope that freedom, joy and healing will bring her back to life. In the film, we see Ciera’s Sophia living with the tragedy and we feel her torment. Scott Haze plays a military man and someone that is also associated with this tragedy and the two grieving people come to experience much together. As Jim’s first try at directing, I found Post to be more that satisfying. There are several scenes that I thought were exceptional. The scene on the beach when we first meet Scott’s character, all the scenes at his home in Texas with his family, but the last scene in the film for me was the best. It is very touching and gives us all hope for a better future. His family are remarkable as are Ciera and Scott in the lead roles. I am still amazed that the film was shot without a crew, without a single lighting set up and is exclusively acted by either non-actors or members of Playhouse West. To a packed house (the premiere was sold out), we all watched Post and I am happy to report that I think it is definitely worth seeing. After the film ended and the lights came up, Jim and Ciera came to the stage and held a very fascinating Q&A. During the Q&A Jim elaborates on the story he told during the earlier interview about what inspired him to make the film, and it’s certainly worth hearing. Below, in 5 parts, is that Q&A with the Parracks. You might need to let the videos load before playing. At the end of the Festival, we all learned that Jim’s film had swept the awards winning Best Film, Best Directing, Best Actress, and Best Supporting Actor. The Best Actor award although didn’t go to anyone in Post, it stayed in the family as True Blood’s Marshall Allman took home that prize. Also at the event was True Blood’s Alexander Woo; which is a testament to the stories that True Blood really is a family. I want to thank Jim for letting me into this very personal experience of his and to Ciera and to Scott who were not only wonderful in the film, but have been so generous with their time. I think this is the beginning of something for Jim and I wish him the best with it. John Cassavetes is looking down smiling, I know. Thanks to Shadaliza for preparing the red carpet video, thanks to M’Lou for shooting the Q&A and to Filmchick for sharing some of her photos.